Indigenous Eye Health at the University of Melbourne will present the Leaky Pipe Awards during the dinner at the Close the Gap for Vision by 2020: Strengthen & Sustain – National Conference 2019 to recognise and celebrate the achievements of individuals and groups in progressing activities to Close the Gap for Vision. A conference dinner will be held on the second night of the conference, Friday 15 March 2019. The dinner’s highlight is of course the Leaky Pipe Awards. IEH invites nominations to recognise and celebrate the achievements of individuals and groups in progressing activities to Close the Gap for Vision. 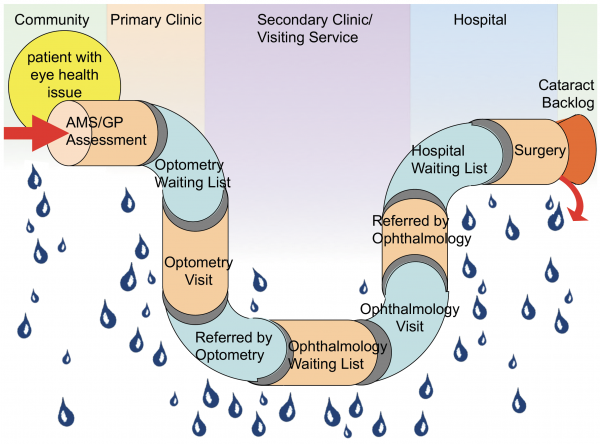 Background: ‘The Leaky Pipe’ has been used to illustrate the complexity, difficulty and challenge for a patient to successfully navigate the eye care service system and exit with delivery of a treatment outcome at the other end. The leaky pipe shows the many steps, providers and locations in the pathway for an eye care patient and the high potential for patients to drop out of the pathway or ‘leak from the pipe’. Efforts to Close the Gap for Vision require fixing the leaks in the pipe (and removing the bung representing public cataract surgery) and the pathway will only successfully deliver care when all leaks are fixed and steps effectively coordinated. Eligibility: Nominations are invited from all Indigenous eye health stakeholders for individuals, groups or organisations who have made a significant contribution or achieved demonstrable outcomes to Close the Gap for Vision. Selection criteria: Selection criteria for the awards include demonstrable achievements to close the gap for vision through community engagement, service delivery or regional implementation, and we are particularly interested in unsung heroes. Work in cataract, refractive error, diabetic eye care and trachoma care, at a systems, clinic, community or patient level will all be considered. Awards will be focused on contributions over the preceding three years. Nominations: The nomination form requires contact details of the person making the nomination in addition to information regarding the individual, group or organisation that is being nominated. A 300 word maximum statement in support the individual, group or organisation that is being nominated is requested, plus names and contact details of a supporting referee. Award selection: We would like to present three Leaky Pipe Awards in 2019 and an award selection panel will be established and advised prior to closing date for nominations.